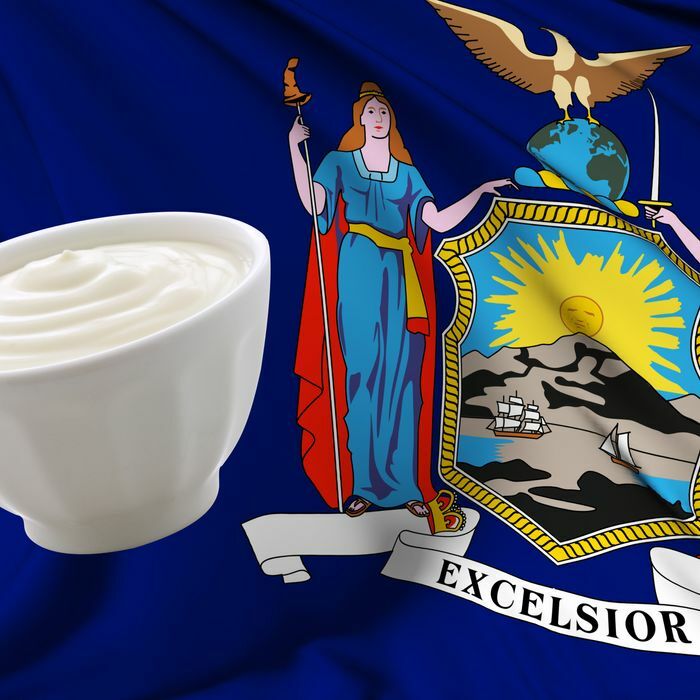 Today, it became official: Yogurt is the state snack of New York. This is a watershed moment for yogurt, which has been experiencing a recent turnaround rarely seen in the world of cultured dairy products. And yet, it’s hardly the only moment of triumph in yogurt’s long, complicated story. Join Grub Street as we look back at the good, the bad, and the Go-gurt. 1942: America is at war and resource-strapped. Young yogurt entrepreneur named Juan Metzger mounts a campaign to market yogurt as an ideal meat substitute. It does not succeed. But Metzger later pioneers the practice of packing fruit at the bottom of yogurt containers to offset its acidic taste. Dannon takes off. 1952 through 1970s: Yogurt enjoys a few decades out of the spotlight. 1976: New York finds “some 40 kinds of yogurt in three sizes” in the average supermarket. “Sundae-style” is used commonly to describe fruit-on-the-bottom yogurt. Seeking to uphold the central mystery of its newest market, an industry rep tells Florence Fabricant that frozen yogurt could not be made at home. FloFab defiantly makes her own fro-yo. 1977: Dannon’s famous “Georgians over 100” ad catapults the industry to stratospheric heights with its depiction of really old people in the Soviet Bloc chopping wood and hoeing the sauerkraut fields. Georgians apparently do like yogurt, especially as a sunscreen and for first-degree burns. “Now, we’re not saying that Dannon yogurt will help you live longer,” the narrator explains, before basically arriving at the point that Dannon’s low-fat yogurt will effectively make you live longer. 1982: Little Rock-based TCBY goes national, introducing stabilized frozen yogurt that bears no actual resemblance to genuine yogurt to millions of Americans. This marks the dawn of what you might call yogurt’s Cookie Dough Era. 1983: A Brigham Young University professor invents what eventually becomes Go-Gurt, thus enabling untold numbers of millennials to do things like ride skateboards and eat yogurt at the same time. 1992: The yogurt market is now $1.135 billion. A Dannon ad signals a new era of yogurt intimidation, telling people “you can’t change the world, but you can change the way you live.” Also, the company releases yogurt that comes with sprinkle packs. 1998: Twenty-one years after Dannon’s game-changing Georgian ad, the Times reveals the truth: No one over the age of 100 actually eats the stuff. 2005: Pinkberry opens its first store in L.A. It is not long before it becomes a mini-phenomenon. 2007: Greek yogurt upstart Fage, which has been around since the 1920s but is just beginning to crack open the U.S. market, puts up a billboard during the Macy’s Thanksgiving Day Parade that depicts Tweety-Bird stuck headfirst in its “ridiculously thick” product. 2012: New York’s first official Yogurt Summit goes down in Albany. 2013: Grub Street discovers Brogurt, which is exactly what it sounds like. 2014: The fro-yo bubble bursts in NYC with scores of closures; green juice shops move in. 2014: During the Olympic Games, Russia prevents Team USA from receiving a massive shipment of delicious Chobani. Some 5,000 individual cups are eventually donated to area food banks. 2014: The New York State Senate votes to make yogurt the official state snack, but not before an hour of debate and a torrent of parentheticals. “Did the sponsor consider pretzels?” someone asked. “What if the pretzel was dipped in yogurt?” Jon Stewart has a field day with the proceedings. October 15, 2014: Governor Andrew Cuomo signs the bill into law. An unprecedented, glorious new era of yogurt-y things will presumably commence tomorrow.